These nylon shells are hand-crafted to duplicate a high quality, traditional wax candle. Manufactured from solid nylon, not made from tubing. Advent set of 4, 3 blue, 1 pink. Also available 3 purple, 1 pink. Optional Christ Candle available, 14" x 2-58". 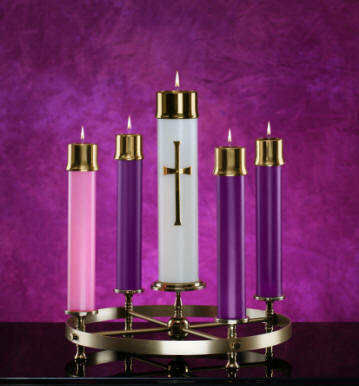 Christ Candles are available in any size on request, please choose "extras" in the drop down menu or call for details. For use with oil candles. Followers sold seperately. Manufactured from Solid brass. They are available in either high polish or satin brass finishes. Custom heights and diameters are also available. Please call for details and pricing - 1.800.440.5658 or email info@catholicshop.ca.